Last weekend I had the privilege of doing a book signing at two different Bookmans bookstores. 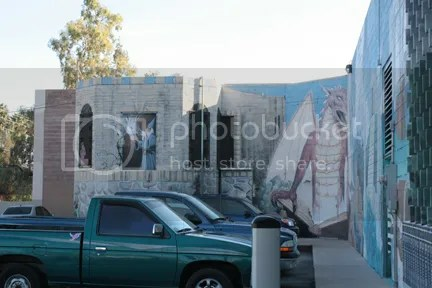 Both were in Tucson, one at the Speedway location and the other at the Grant location. I had initially received an email from the Grant location stating that they usually don’t have much success with book signings at their location. The event coordinator, Travis, was more than happy to have me at the store though, and I figured since I was already in the area that day doing a signing at the Speedway location, why not? Why not indeed. First off, the promotional materials I brought with me were a step up from what I had on hand at my Borders signing in November. 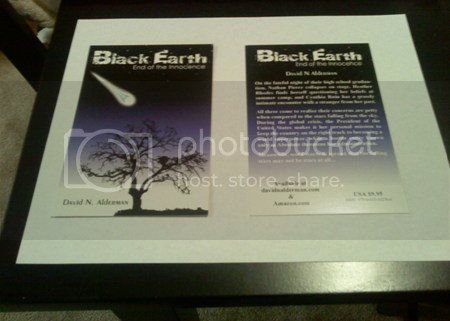 I had postcards made, with my cover on one side and the back-of-the-book description on the other. These were done pretty well and at a very affordable price from psprint.com. Then I decided to print my prologue on single sheets of paper with my name and web address at the top and offer them to customers as they passed by the table. This would give them an opportunity to get drawn into my book right off the bat instead of me waiting for them to pick up the actual book. Both tools came in handy and were successful in their own rights. I found people standing in front of my table at times reading through the whole prologue and then taking that and a postcard with them as they browsed through the store. The signing at the Bookmans Speedway location was great. 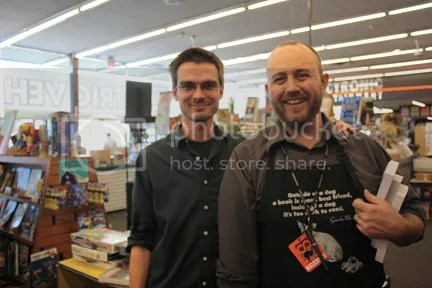 I sold 4 books that day in a two hour timeframe, one of them to a store employee who looked at one of aforementioned postcards and decided he had to have a book. Originally being positioned off to the side of the double entrance, it took me a bit to get out of my comfort zone and get reacquainted with being an outgoing author. Once that kicked in, I realized that I would be better off setting up my table in front of the giant stone sphere that was propelled by water that stood in the center of both doors, greeting everyone that came into the store. Once I moved the table there, I had much better luck getting the people that came into the store. It helped that the girl scouts were outside doing cheerleader maneuvers to pull people closer to the store, though they would have been better suited helping me sell my books. The signing went well and my brother and my wife and I traveled to McDonalds, grabbed a quick bite, and headed off to the second signing at Grants. The outside of the store was my first indication that this was no ordinary Bookmans, not that Bookmans is ordinary in any capacity. After entering the store, I was greeted by Travis, the person I had only emailed briefly about my event there. He was pretty laid back and already had a table set up for me in prime location in the front of the store. The first thing he asked me was if he could get me something to drink since he was going to Walgreens. He nabbed my wife a Dr. Pepper and me a Mountain Dew, seeing how I was losing a bit of steam from the drive to Tucson that morning and the first signing. From there, it was an experience. 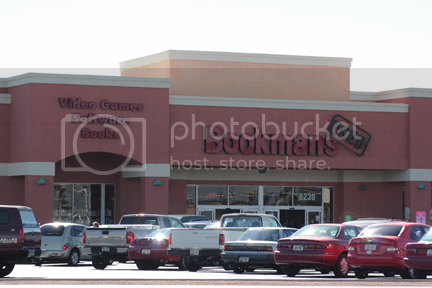 The people that came into that Bookmans that day were as diverse as the world itself. From a man that tried to explain the plots in my book as alien infiltration phases to the kid that kept coming back to the table and stealing all of the chocolates I had laid out, I was never bored in the whole 2 hours that we were there. Midway through the signing, a stack of pizzas was delivered, a promotion that Travis had set up to get people interested in the Love of Reading month that Bookmans was having. He offered us pizza as well. I sparked up some conversations with customers and even with the friendly staff in the store. There was even a dog adoption going on in the store. My brother turned to me at one point and told me the place reminded him of the music store in Empire Records. Truer words have never been spoken. He gave me a discount on my purchase there in the store (I couldn’t be at a bookstore for that long and not get something), and he even sent us home with a whole pizza as a token of appreciation for us coming out there. Once again, that was the store that I had expected to have the least amount of success at. 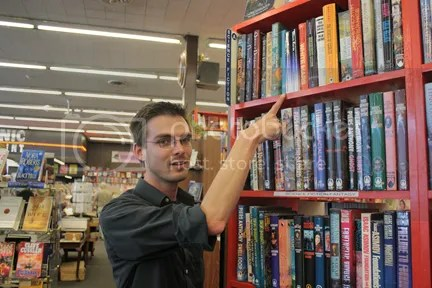 In all, I sold 11 books between the two stores. 4 at the Speedway location, 2 to customers at the Grant store, and then the 5 that Travis bought. I had a great time at both Bookmans. Their stores are clean, friendly and full of life. 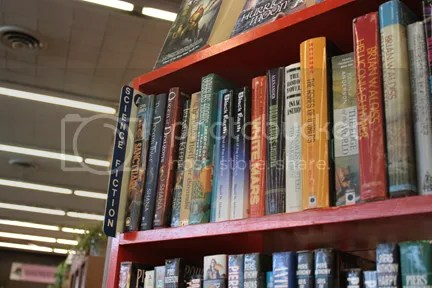 But having my book put on the shelf…near Kevin J. Anderson and Piers Anthony…priceless! Awesome!!! That had to be an amazing feeling to see your books on the shelf of a book store. Especially since you hear all the time that self-pubbed books never make it there :). Good for you!! !